Arceo himself is a child of two worlds. He was born in rural Mexico, but emigrated in his twenties to the United States, eventually taking residence in Chicago. He uses his personal experiences with multinational identity as inspiration for his artwork, and an uncommon medium—linocuts—to invoke the feeling of the foreign that he considers. 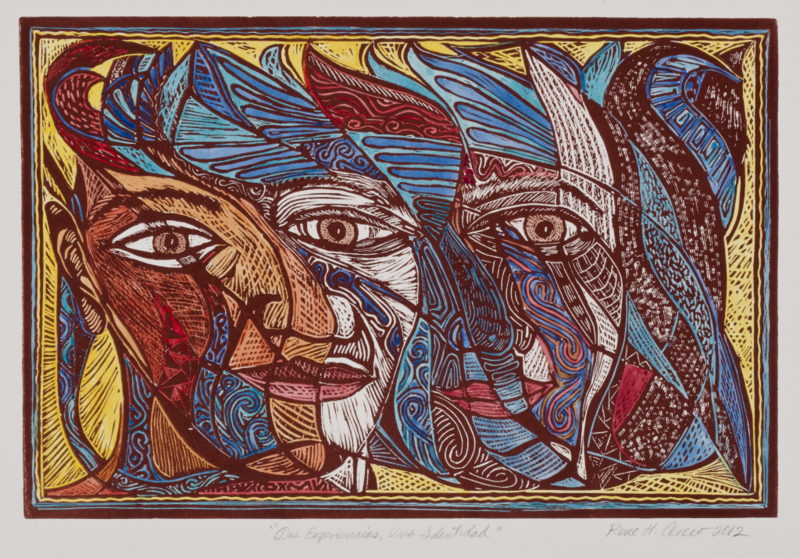 To create each linocut, Arceo etched the mirror image of the work onto a sheet of linoleum. The process requires mastery of the tools and great precision, and Arceo displays great competence with his medium by also incorporating watercolors. The result is a collection of deeply descriptive and visually striking works. “Dos Experiencias, Una Identidad” features select works from Arceo’s own collection, subdivided around three focal points: spirituality, portraiture and indigenous peoples. The first mini-collection contains the work for which the exhibition is named, and attempts to tackle the subject of spirituality in a manner that is not specific to any one tradition. Arceo does not limit his work to religion, but captures more abstract impressions of spirituality. His beautifully etched images convey a sense of interconnectivity—a spirituality that attempts to be universally felt and understood. The portraiture section has a more personal focus; the faces that stare back all hold a specific emotional attachment for Arceo. They are people Arceo either admires or by whom he has been inspired. These include his wife, their unborn son, Francisco Mendoza, and William Shakespeare. Arceo’s final section features portraits of various indigenous peoples Arceo has encountered throughout his life. In each of these works, Arceo has retracted the name of the subject, and identifies them instead through different terms, such as their traditional vestments, the region in which he encountered them, or the culture they represent. In each image, and the section, Arceo is able to simultaneously capture the solitude and the precarious future of each subject. Arceo’s exhibition, open through July 12, takes a unique approach in its visual depiction of the lives and experiences of multinational people. Arceo transcends the use of the linoleum as a canvas not only by creating the mirror image of the print, but also by using the print to mirror his own experiences. His etched lines come together to form an image of and a reflection on his interpretation of multinational identity.